The State of the Streets update is the annual action from our Mobility Advocacy Plan where we report to members on our progress with MAP action implementation. It includes information on important transportation news from the neighbourhood and resources such as promotional codes for a free trial of Mobi Bike Share and free sign-ups to Modo Carshare for Business. 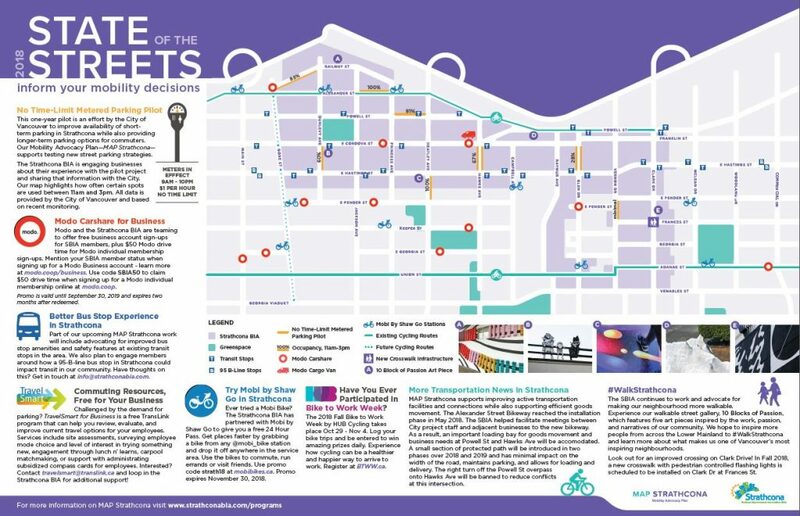 Download the State of the Streets Map here to help inform your Strathcona mobility decisions. 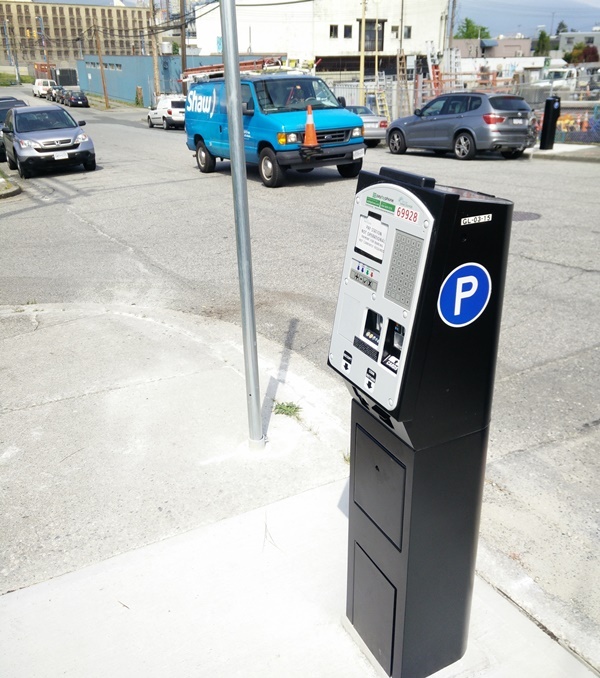 This one-year pilot is an effort by the City of Vancouver to improve availability of short-term parking in Strathcona while also providing longer-term parking options for commuters. Our Mobility Advocacy Plan – MAP Strathcona – supports testing new street parking strategies. Meters in pilot locations are in effect from 9am – 10pm, the cost is $1 an hour and there is no limit on how long you park there. The Strathcona BIA is engaging businesses about their experience with the pilot project and sharing that information with the City. Our map highlights how often pilot locations are used between 11am and 3pm. All data is provided by the City of Vancouver and based on recent monitoring. 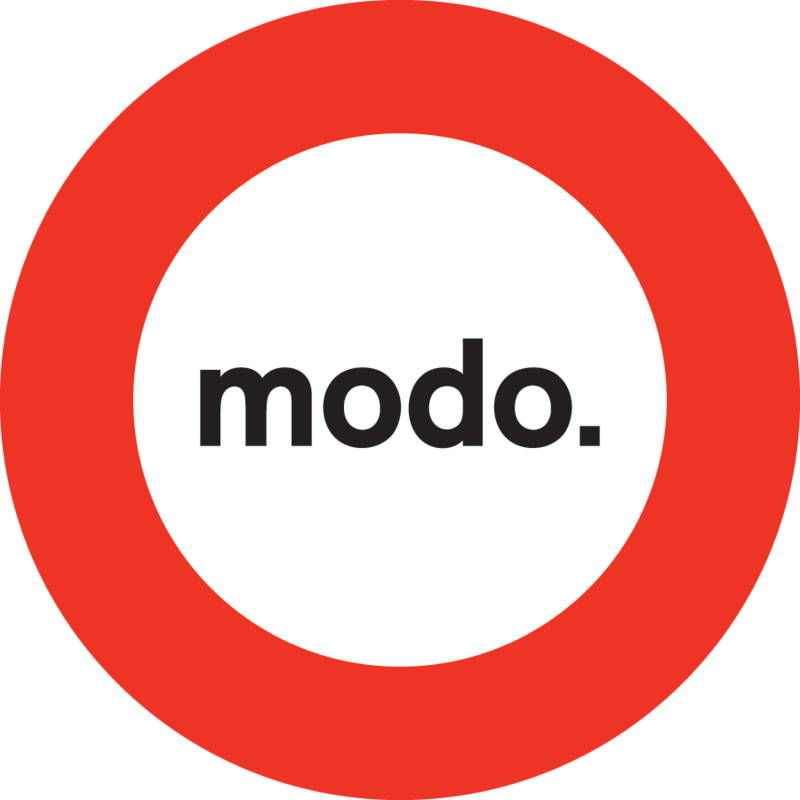 Modo and the Strathcona BIA are teaming to offer free business account sign-ups for SBIA members, plus $50 Modo drive time for Modo individual membership sign-ups. Mention your SBIA member status when signing up for a Modo Business account. With Modo, you always have the right-sized fleet and can add an unlimited number of drivers to your account. You can choose from a range of vehicles in the Strathcona area, including a Nissan Compact Cargo Van. Learn more at modo.coop/business. Use code SBIA50 to claim $50 drive time when signing up for a Modo individual membership online at modo.coop. Promo is valid until September 30, 2019 and expires two months after redeemed. Part of our upcoming MAP Strathcona work will include advocating for improved bus stop amenities and safety features at existing transit stops in the area. We want to improve the experience of taking transit to and from Strathcona. 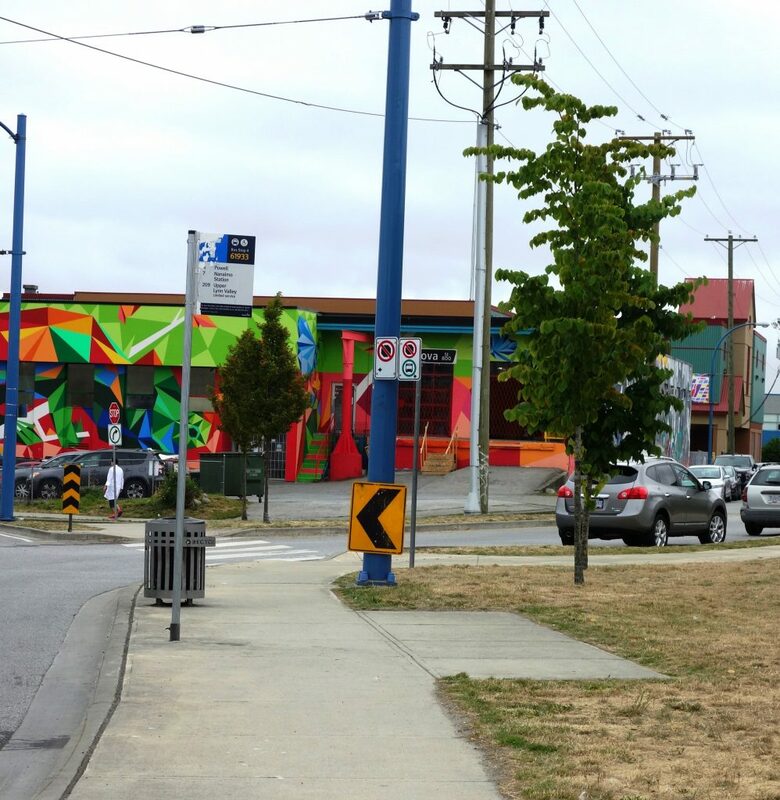 We also plan to engage members around how a 95-B-line bus stop in Strathcona could impact transit in our community. Have thoughts on this? Get in touch at info@strathconabia.com. Challenged by the demand for parking? TravelSmart for Business is a free TransLink program that can help you review, evaluate, and improve current travel options for your employees. Services include site assessments, surveying employee mode choice and level of interest in trying something new, engagement through lunch n’ learns, carpool matchmaking, or support with administrating subsidized compass cards for employees. Interested? Contact travelsmart@translink.ca and loop in the Strathcona BIA for additional support! You’ve likely noticed the new Mobi Bike Stations in the Strathcona area. Through our MAP engagement efforts we were able to help provide feedback to Mobi Bike Share on desirable locations for Mobi stations in the area. Ever tried a Mobi Bike? 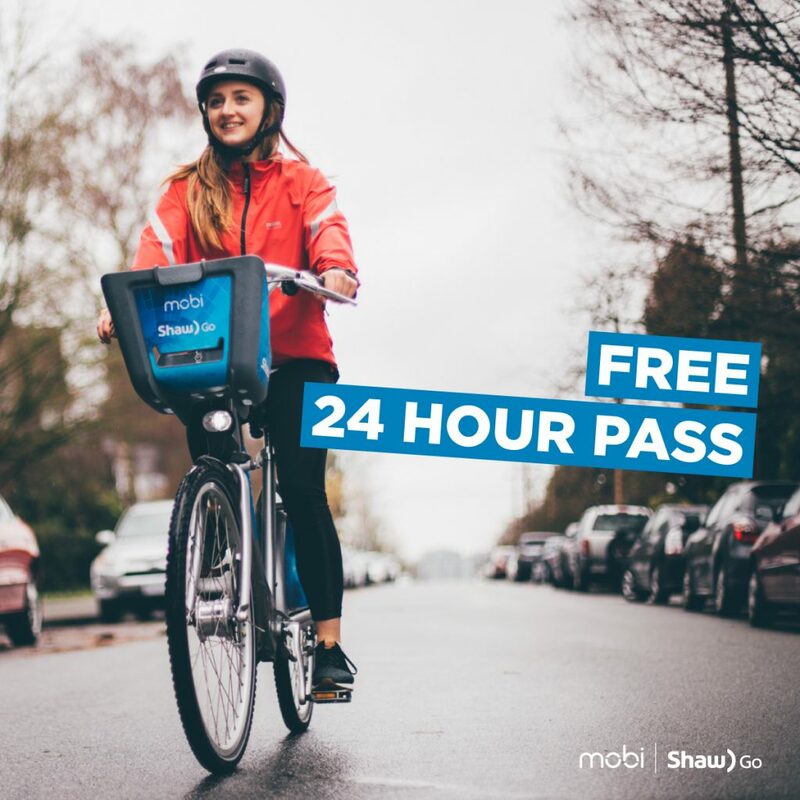 The Strathcona BIA has partnered with Mobi by Shaw Go to give you a free 24 Hour Pass. Get places faster by grabbing a bike from any @mobi_bike station and drop it off anywhere in the service area. Use the bikes to commute, run errands or visit friends. Use promo code strath18 at mobibikes.ca. Select the 24 hour pass when signing up as a new rider and enter the promo code. Promo expires November 30, 2018. Have you ever participated in Bike to Work Week? 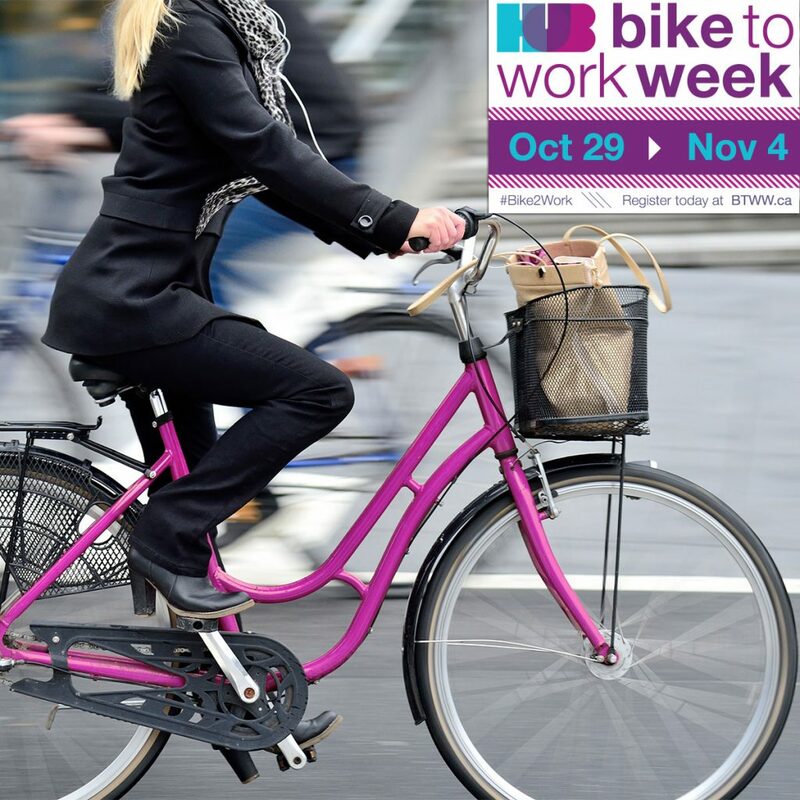 The 2018 Fall Bike to Work Week by HUB Cycling takes place Oct. 29 – Nov. 4. Log your bike trips and be entered to win amazing prizes daily. Experience how cycling can be a healthier and happier way to arrive to work. Register at BTWW.ca. MAP Strathcona supports improving active transportation facilities and connections while also supporting efficient goods movement. The Alexander Street Bikeway reached the installation phase in May 2018. The SBIA helped facilitate meetings between City project staff and adjacent businesses to the new bikeway. As a result, an important loading bay for goods movement and business needs at Powell St. and Hawks Ave. will be accomodated. A small section of protected path will be introduced in two phases over 2018 and 2019 and has minimal impact on the width of the road, maintains parking, and allows for loading and delivery. The right turn off the Powell St. overpass onto Hawks Ave. will be banned to reduce conflicts at this intersection. 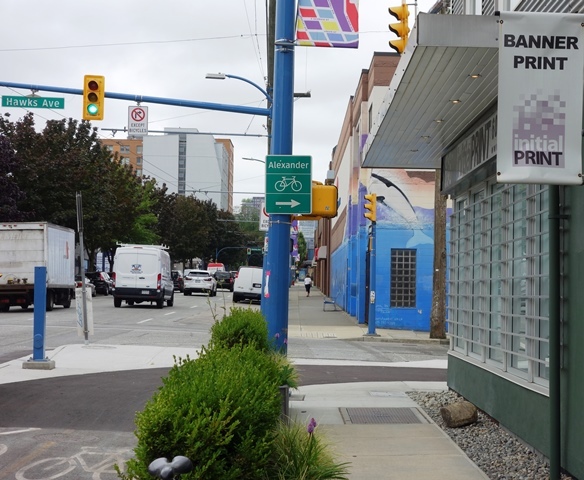 The SBIA continues to work and advocate for making our neighbourhood more walkable. Experience our walkable street gallery, 10 Blocks of Passion, which features five art pieces inspired by the work, passion, and narratives of our community. 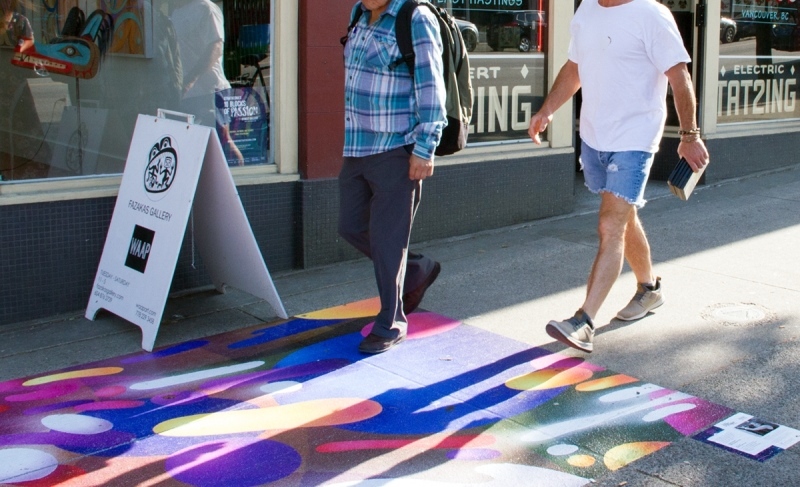 We hope to inspire more people from across the Lower Mainland to #WalkStrathcona and learn more about what makes us one of Vancouver’s most inspiring neighbourhoods. Look out for an improved crossing on Clark Drive! In Fall 2018, a new crosswalk with pedestrian controlled flashing lights is scheduled to be installed on Clark Drive at Frances Street.